Ushers dressed in penguin tuxedos helped set a theme of elegance for the ensuing show which was neither an opera, nor a musical, but a love-child of the two, sporadically mixing operatic songs and ballroom dances with more traditional musical numbers. The lights flicker, alerting the audience to settle in, and ‘A Little Night Music’ begins. 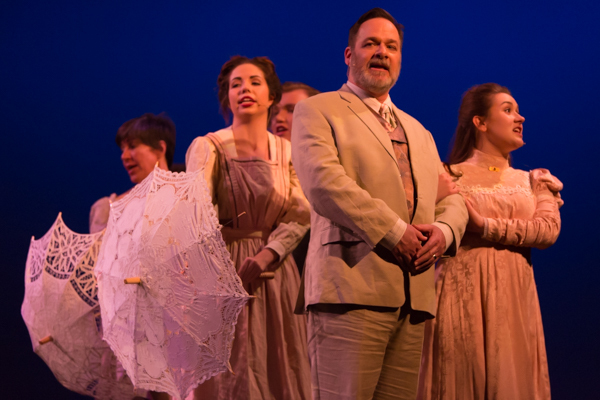 Based on the 1955 film, ‘Smiles of a Summer Night,’ 'A Little Night Music' was adapted for Broadway by composer and lyricist Stephen Sondheim in 1973, where it won three Tonys: best musical, best book and best original score. The story takes place in Sweden at the turn of the nineteenth century, taking heavy topics and masking them in a seemingly lighthearted story about silly people — young, middle aged, elderly — having affairs, marrying the wrong people, gossiping, scheming, and ultimately spending an enlightening weekend in the country to work out all the tangles. ‘Night Music’ follows the intertwined story of three families: The Armfeldts, the Egermans, and the Malcolms and their tangled web of romances all centered on the enticing Desiree Armfeldt played by actress Macall Gordon. Unfortunately for those who may be interested in seeing it, SCCs debut of the show has already come and gone: it's only three performances having happened between February 19 and 21. Early on, we are introduced to a waltzing quintet that appears several times throughout the show to provide choral commentary, which communicated more with belting voices, impressive ranges, and piercing notes, and less with intelligible lyrics. The quintet was lead most memorably by the falsetto of Melissa Young, and the baritone Trevor Eaden. The quintet was responsible for bringing the show its opera moments, as well as adding a little bit of seriousness to the show. A seriousness that reminds the audience to pay attention to the subtleties in Sondheim's work and the old-world dances such as the mazurka and polonaise, which transport the audience to what some might consider a more sophisticated time. As the story unfolds, we first meet the Egermans: Charismatic lawyer Fredrik Egerman (John Carroll); his second wife, bubbly and painfully naive Anne Egerman (Kaelyn Barnes) and; his son, boyishly charming and timid Henrik Egerman (Nicholas Edmondson). Carroll's timing and comedic delivery in this early exchange are worth mentioning as he portrays the struggle of a middle-aged man trying to keep up with his much younger wife. Barnes' energy and character commitment were captivating, but it was Edmonson's singing voice, wholesome tone, and innocent portrayal of Henrik that made him the performer to watch. But as the 'Night Music' continued and the plot got going it was the women who stole the show. Perhaps the most entertaining exchanges of optimism and cynicism came from the young, wide-eyed and clever Fredrika Armfeldt (Erin Smith) and her brassy, jaded grandmother Madame Armfeldt (Johnna Ebanks). Also, the character Countess Charlotte Malcolm (Amy Harris) played a fine line between victim and antagonist beautifully, in a very relatable fashion. Most impressive, however, was Gordon's performance of Desiree. In her songs she gets to be introspective (“The Glamorous Life”), funny and charming (“You Must Meet My Wife”), and heartbreaking (“Send In the Clowns”), all the while managing to remain completely lovable. Desiree is dying, according to her, for “some sort of coherent existence after so many years of muddle,” and Gordon makes us root for her success. One audience member Janice Cushing, a fan of Sondheim's 'A Little Night Music'. Shared her thoughts. She had seen other productions of the show before, and during the intermission, after the first act ends with a bit of a cliff-hanger, she was excited at the notion that audience members may be trying to guess how the show would conclude based on Sondheim’s foreshadowing.